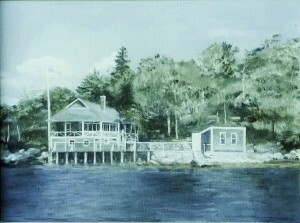 Photo of Seanook taken from along the shoreline in Spring. Welcome to Seanook! 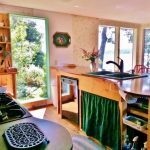 This long-time family summer cottage is now a year-round vacation home in Mid-coast Maine. Seanook has a unique vantage point in East Boothbay grandfathered on the beach next to its own rocky point with four decks and floor to ceiling windows unfolding water views in three directions, including a tantalizing vista to the mouth of Linekin Bay and the open Atlantic. Watch spectacular sunsets as you enjoy the cool, health invigorating salty sea breeze or in winter bask in the glow of the fireplace stove. Seanook is so close to the water that the tide comes in around and under it. Being here is like staying on a boat, except it doesn’t rock. On a rainy night the pitter-pat on the roof will lull you to sleep. Wake up to the call of seabirds and the sloshing of little waves. Seanook is an ideal place for a small reunion or retreat. Yet we welcome a couple as readily as a family or group. Enjoy our seclusion in summer as a weekly rental; other times as a weekend getaway, or come any part of the week, or choose is as your monthly vacation house. 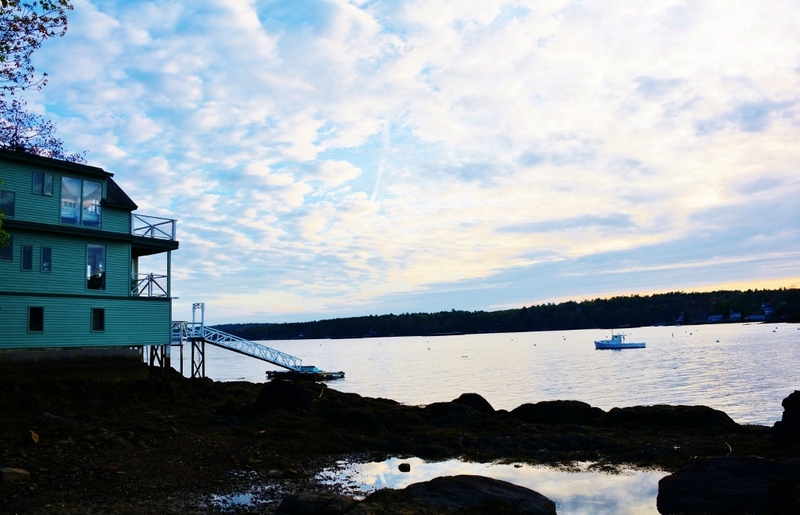 If immersing yourself in the relaxation of our spot doesn’t float your boat, you can venture out to discover coastal activities in nearby Boothbay Harbor. 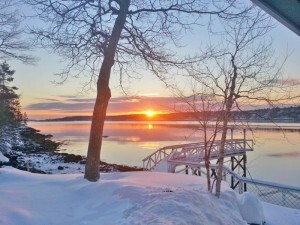 Live theater, artist studios, gourmet seafood restaurants, antiquing, boating excursions, fishing or kayaking on the ocean, or hiking the lush Maine woods are some of the activities to be found in this area. 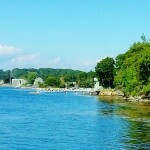 See “About Boothbay” for more things to do. To find Seanook on the map below you can actually zoom in on the earth or satellite versions to locate the “dog-leg” dock; Seanook is immediately next to it. Seanook, Paradise Cottage and Paradise Studio (our shop) appear in a straight line from West to East. Seanook ‘s history: Built as a bungalow shortly after 1900 by the then-owner of the East Boothbay General Store, it had a dock going straight out from the lower deck and an opening underneath where small boats were stored. This enterprising shopkeeper used the building as an annex from which to sell snacks, bait, and fuel to lobstermen on the bay. Subsequent use was as a cabin for “people from away” who were escaping the summer heat to the south, mostly Massachusetts. My parents bought the bungalow through realtor, Mr. Linekin, in 1947. My grandmother knew him because both their families were originally from Pittsfield, ME. My father came up with the name “Seanook.” Every summer he did an improvement project on the building. It was then a 5.5 hour drive from the Boston area. When I acquired the property in 1997, I started gradual renovations to winterize it and add the second floor, the sunroom, entry, and laundry room. After all the major work was done, Ron and I have been making improvements ourselves. When you enter the cottage you will see the painting pictured at right showing the bungalow as it was when my parents had it. 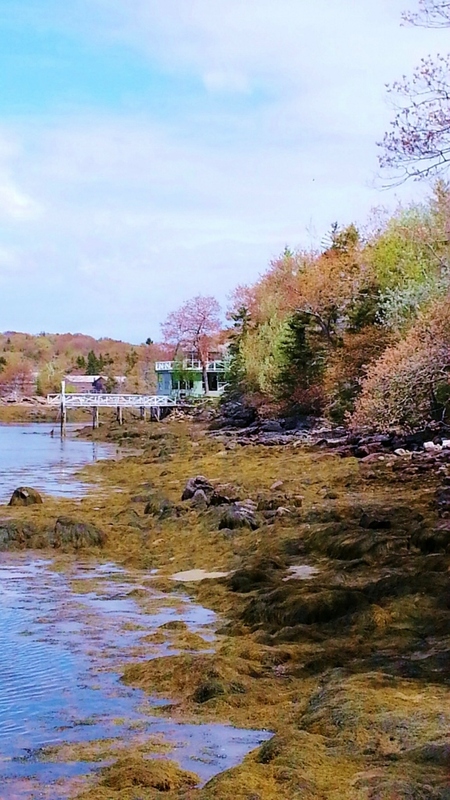 Our shoreline is the authentic rocky coast of Maine. Seanook is grandfathered to be this close to the water; one cannot get anywhere near this proximity with new construction. On a very high tide I have thought, “That lobster boat might drive right into the living room!” For ocean sounds, weather and nature viewing it is unparalleled. For relaxation it is divine. Come experience this proximity to weather, wildlife and water while it is still available for your pleasure.